The book of the week was The Power of Less by Leo Babauta. This book is about having a very simple and efficient focus on work and life. The idea is to have higher productivity and live a more 'zen'-like life. The author, Babauta, even has a blog entitled Zen Habits. I only have one tip for you this week. The book is very consolidated and a lot of the ideas in this book might help it's reader, but I the only one I find will help everyone is the concept of batching. Batching is consolidating emails, voicemails, and calls into one or two times a day. People get in the bad habit of checking emails and voicemails several times a day. Anytime they have a couple minutes between projects they go in and see if anything has changed within their inboxes. At the very most with this type of habit, you'll have one email each time you check it, if any at all, and then you'll spend a few more minutes composing a response. The main thing that makes this unproductive is the effect it has on your focus. If you have a project to work on and you work diligently and are in 'the zone' the whole time, you get more done and produce better results. If you stop to make yourself distracted every hour or two, you nearly have to start from scratch in terms of creativity and momentum. When you batch emails and voicemails, you pick the minimum number of times possible dip in to your outstanding communications. I use two times for voicemails and one time for emails a day, at 10am and 4am I check voicemails and at 6pm I check emails. This way it consolidates the work into a good number before I spend any amount of time digging into it. Again, batching phone calls is very productive and depending on what you do you should combine this task with a different activity. You will inevitably be taking phone calls periodically throughout, and potentially have to make certain 'important' calls too. However, there are a lot of calls that are optional and those should all be written down and done later on. I do a lot of driving, so I have these calls written down to be made when I am on the road. Other people I have talked to go on walks every morning and they make calls when they are taking their walks. It's a good way to kill two birds with one stone and be as productive as possible with your calls in the process. I thought this was a good book. 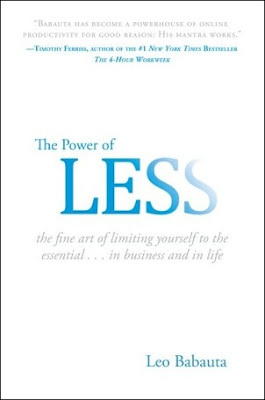 There is a lot of a bullet point format throughout the book, which shows the author practices what he preaches with using 'Less.' If you think you could use a little less stress and a little more simple in your life I recommend you check out this book. As always, if you have any questions on the book don't hesitate to ask. I would be more than happy to help anyone that wants it.